Lat Republican Senator John McCain (Left) and Republican President Donald Trump. 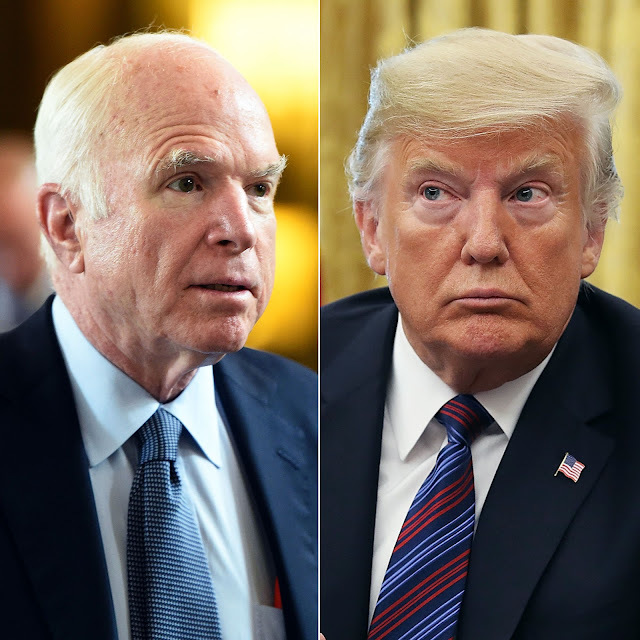 VietPress USA (March 19, 2019): On Monday, during an Oval Office appearance with Brazilian President Jair Bolsonaro, Trump railed against McCain’s 2017 Senate vote against a Republican bill that would have repealed the Affordable Care Act. “I was never a fan of John McCain and I never will be,” Trump said of McCain, who died of cancer on Aug. 25, 2018. "I can’t understand why the President would, once again, disparage a man as exemplary as my friend John McCain: heroic, courageous, patriotic, honorable, self-effacing, self-sacrificing, empathetic, and driven by duty to family, country, and God." Willard Mitt Romney (born March 12, 1947) is an American politician and businessman serving as the junior United States senatorfrom Utah since January 2019. He previously served as the 70th Governor of Massachusetts from 2003 to 2007 and was the Republican Party's nominee for President of the United States in the 2012 election. Why Trump so hates Republican Senator John McCain? The Washington Examiner wrote that "President Trump's Twitter attacks on the late Sen. John McCain, R-Ariz., over the weekend — including his retweet of one supporter who explained that she "hated" the late senator — invite the question: Why does Trump harbor such a special hatred for the long-deceased McCain? Well, Trump would suggest it's three factors. First, there's McCain's transmission of the so-called Steele dossier to the FBI. Compiled by Christopher Steele, the former British intelligence officer, that dossier suggested Trump's involvement in various nefarious and lewd activities. Then there's McCain's decision to vote down the health care bill sponsored by his friend Sen. Lindsey Graham, R-S.C. That bill, which would have passed had McCain supported it, would have replaced the Affordable Care Act, also known as Obamacare. Finally, there's McCain's sustained criticisms of Trump during the first 18 months of his presidency. I think these issues play into Trump's deep dislike for McCain, but there's an even more basic rationale for his fiery fury: McCain encapsulates everything Trump despises most in American politics. Most obviously, McCain was and is an eternal marker for Republican disenchantment with the Trump presidency. Trump is gravely aggravated by this disenchantment because he believes he has earned a right to be treated as the modern Caesar of contemporary Republicanism, a leader entitled to absolute, unflinching loyalty. Trump simply cannot rationalize why McCain was able to reject his presidency and somehow also retain the respect of Republicans. But it's not just that McCain refused to kiss the emperor's ring. It's that McCain knelt to a different ideal outside Trump's court, and one for which Democrats and the media at times praised him. Trump has little regard for military service in and of itself. He judges service by obvious outcomes alone and not sacrifice for a cause. This takes us to the context of March 2019. Increasingly enraged by the media's refusal to bow to him, Trump feels the continued celebration of McCain as just more salt in the ego wound. Yes, McCain obviously deserves better than this scorn. But Trump's rage against him is unlikely ever to waver." Sen. Mitt Romney, R-Utah, denounced Donald Trump Tuesday over the president’s latest attacks on John McCain. In an interview with CNN in January, Romney pledged to make his disagreements with the president known. 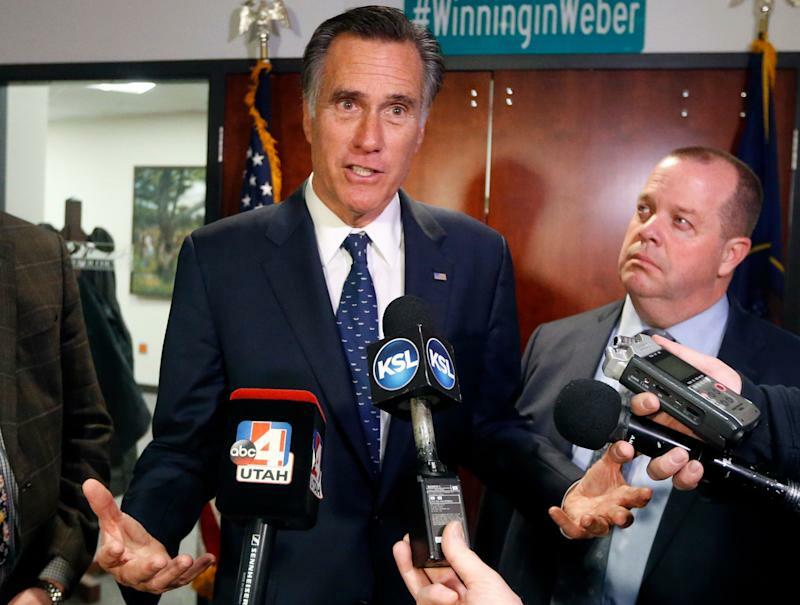 “Where I disagree, I’ll point that out,” Romney said, and he got that opportunity on Tuesday. During an Oval Office appearance with Brazilian President Jair Bolsonaro, Trump railed against McCain’s 2017 Senate vote against a Republican bill that would have repealed the Affordable Care Act. Trump continues to attack John McCain nearly seven months after his death. "I was never a fan of John McCain and I never will be." Trump also went after McCain over the weekend, accusing him of sharing a copy of the Steele dossier on the billionaire’s ties to Russia with the media before the 2016 presidential election. McCain’s daughter Meghan McCain, a co-host on “The View,” blasted the president over his comments. Whereas Romney and Meghan McCain directly confronted the president, Sen. McCain’s longtime friend Sen. Lindsey Graham, R-S.C., who had been, until Tuesday, muted in his criticism of Trump, took issue with the president’s latest comments.